I always wanted to do something that impacts daily lives of common people. Even during my time in college, at NIT Durgapur in 2009, I was interested in building something that people could use in their day to day life. In college, I became friends with people of diverse ethnic backgrounds from across India and many foreign countries. I was exposed to their culture and specially their food. After completing my MBA at Symbiosis, I was keen on starting something, and I was searching for a genuine problem which could be solved with technology. At the same time, I was working for a startup in establishing their supply chain from scratch, and I found this field to be exciting. So I was more excited in something which solved problems of end users through improvising the supply chain. During a trip to Ahmedabad, a friend took me to its famous eating joints. Those stores were famous for their unique and specific food items, and were crowded with tourists trying to buy the specialties. Customers were getting it parceled in bulk so they could take it back to their city. Likewise in Bangalore one weekend, a Jain friend of mine invited me to dinner. He had just returned after a vacation from Rajasthan and served me food topped with Rajasthani pickle. I asked if he had an extra bottle of the pickle. He said he could only get it from Rajasthan during his next visit, whenever that happened. Thanks to these repeated incidents, I realized every region has their own taste and specialty delicacies (apna wala taste), and people want to have food from the regions they’re originally from. When people change cities, they don’t have access to their native delicacies. They not only miss food, but also memories associated with it. There is also a large chunk of non-native people who like variety of traditional food from any specific region. They have to be dependent on friends, relatives or their future visits to get that food product. There are people who pay extra for baggage fees at airports just so they can bring food with them while returning from home. I found out there is need of a service that can bring authentic traditional delicacies from every region and make it available to the doorsteps of these people. That’s when FomoKart was born. Fomo means Fear Of Missing Out. I started researching on the country’s most sought-after food items. I made list of famous delicacies from across India. I asked my friends who live in different cities to courier me those food products. They used to ship me specialty foods from their city in predefined packaging. After many trail runs, we knew what the best packaging material was how to ship food items so that they are fresh and intact. I tested the market by putting up stalls in societies and apartments across Bangalore. These stalls had unique food products sourced from different parts of the country. 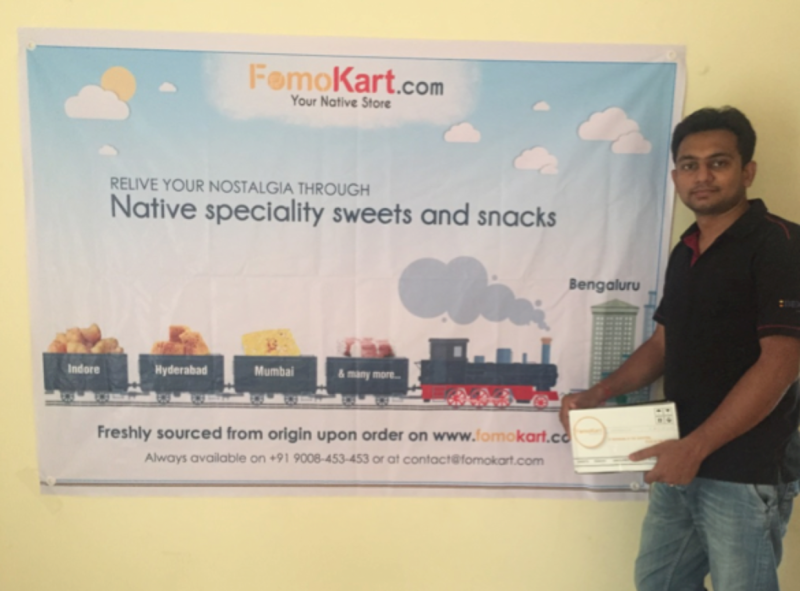 My target customer was non-Bangaloreans, and I was able to attract them with display of unique food we had. They were excited to see their hometown food available to taste and purchase. These customers were a real source of information about their food preferences and kind of service I intended to start. They gave lots of information about their native food which they don’t find in metros and were seemed very interested in the service. I spent more than 3 months in travelling to different cities to bring all the famous food makers onboard, building the supply side of FomoKart. I met many regional famous producer of sweet, savory, pickle for partnership. Convincing them to come aboard and to sell their delicacies was and still is a challenging task. However, I have managed to succeed gradually and many of them are onboard. My team consists of Niraj, who works on tech, and Sandeep, who contrinuted by designing the packing and establishing the order flow process. We’re already live in the market and have received more than 400 orders. We aim to bring more than 1000 food products from 18-20 states in 6 months.